Seven has won its first night all people for the week off the back of a 900,000+ audience for House Rules. Nine was just 0.5 behind the leader, yet Nine managed to rank #1 with the biggest combined channel share. Gem had a good night with a share of 4.4%. Another multichannel ranking well was ABC2 (also on 4.4%) with its football match between Sydney FC and Liverpool pulling an audience of close to 180,000. TEN’s MasterChef featured a team challenge, which kept the program ranking #1 for the night in the key demos. Home and Away was down from its first two nights this week but it held above 700,000. 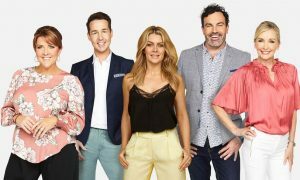 House Rules featured (another) confrontation between the teams and the audience loved it with a midweek crowd of 936,000 which is well up on last week’s 807,000 on Wednesday. The show is promising more drama on Sunday with a walkout! The Aussie Property Flippers were at work on the Goldie and western Sydney with 502,000 watching, which is close to last week’s 525,000. A Current Affair continues to perform well with just under 900,000, a small lift on last week’s midweek audience of 861,000. The program looked at the chances of winning with Scratchies and then Trevor Long had advice for people selling old mobile phones. Britain’s Got Talent was flipped into the 7.30pm timeslot. It didn’t challenge House Rules or MasterChef, but it did lift Nine’s share in the timeslot after two weeks of The Last Resort. Speaking of which, The Last Resort only screened in Sydney and Brisbane with 172,000 last night. Other markets got the AFL Footy Show. Its combined metro audience was 239,000 with the Melbourne audience on 164,000 for the midweek appearance. Steve Price on The Project is always a highlight and he was a good contributor last night. The 7pm audience of 627,000 also saw actor Jai Courtney. MasterChef featured a team challenge and as it was sweet week it was about time chef Darren Purchese made an appearance. The red team were the winners in front of the metro audience of 845,000, which was down close to 100,000 week-on-week. This Is Us followed with 439,000 and then it was Madam Secretary on 195,000. Paralympian Kurt Fearnley was the guest subject on Anh’s Brush With Fame. The penultimate episode of the second season did 512,000. The Weekly With Charlie Pickering was on 587,000, almost bang on what the show did a week prior. You Can’t Ask That was inside the top 20 on 440,000. The audience then halved to just over 200,000 for The Warriors. Episode four of Tony Robinson’s Coast To Coast did 289,000 at 7.30pm. Two episodes of the new Fargo followed with an average of 131,000 for both.